Budapest is the proud Hungarian capital and has been so for a few centuries now. Populated by people culturally and inheritance-wise different from its neighbours, right in the heart of Europe, it was inevitable that it would acquire a personality of its own. Over the centuries it developed into a city unlike many others, but paradoxically also hugely influenced by all the powers that had an impact on its destiny. Culturally, the two major influences on Hungary and its capital over the centuries have been the Turkish and the Habsburg powers. While the Turkish occupation had a big impact on the city over a century and a half (being under Ottoman occupation from 1541 to 1681), the city’s essence remained mainly Western oriented, both thanks to its early inspiration by the renaissance (Hungary was the first country adopting the philosophy of the Florentine reawakening) and the close ties to the Habsburg world. Especially the later part of the nineteenth century signified a cultural upswing for Hungary, intensely felt to this day, both in regards to its architecture, but also in its cultural life, strongly dominated by the strong support for the classical music. 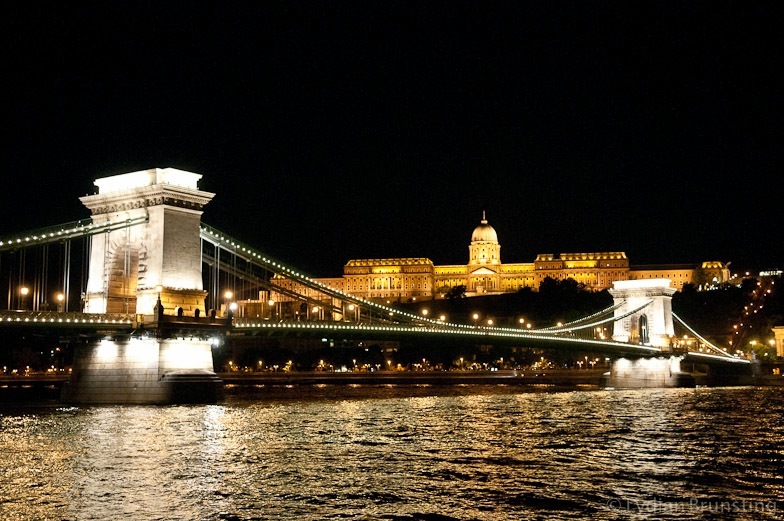 Budapest is a perfect destination if you are interested in European history and arts. This little country being wedged in between East and West, at the crossroads of different cultures, has for centuries been able to maintain its identity despite being a small nation. Once you start looking into its history, taking the step to understand its culture is fully natural. It’s fair to say that Budapest brims with culture and has proudly done so over the centuries. We can easily suggest that as perfect art destination Budapest qualifies with high remarks. Budapest is a fairly big city, its commuter area is home to one third of the country’s total population of ten million. As a visitor you might be surprised by this fact, while strolling the streets of the capital, you’ll rarely find it crowded. The city centre in general is walkable, even though there is likely the need to jump on its efficient public transportation system, if you like to cover all the important sights. Did you, by the way, know that Budapest’s metro system was the first ever built on the European mainland back in 1896 (and worldwide only London with its system built in 1890 proceeded it)? As a visitor, the orientation in the city is fairly straight-forward: the Danube river is there to help you. On the left bank of the river you find Pest, the commercial more modernised part of the city. On the right-bank of the river you’ll find the hilly part of the city, Buda, with its famous Castle Hill. Life on the Buda side is way more quiet, and also way more touristy, at least in the parts where you as a visitor will go. And the view? Simply stunning. Óbuda – the northern part of Buda and meaning the ‘old Buda’ – is a separate district in its own. Many visitors skip this part of the city, but we find it a great spot to visit with some nice museums around and a laid-back atmosphere. It’s especially great for a lazy Sunday afternoon with a late lunch at one of the fish restaurants on its main square, Főtér. 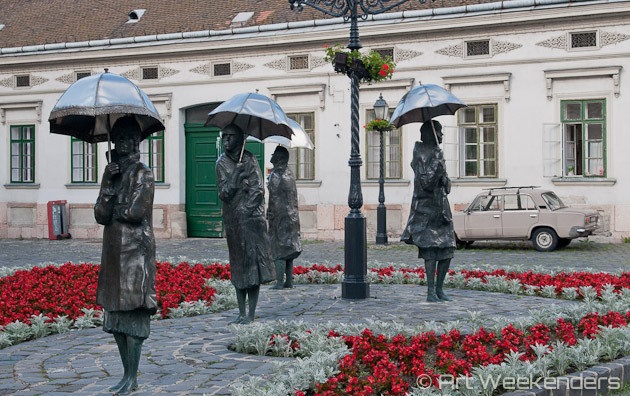 Budapest’s art scene is to this day to a high extent still keeping one foot in the past. Its architecture is dominated by the century-old buildings on both side of the Danube river and the total lack of high-rises is striking. The national opera house – the ‘Magyar Állami Operaház’ on the Andrássy út – is still having a central role in the cultural life of the city. Almost uniquely in today’s world Budapest together with Vienna could be said are the protectors of the classical music scene, even though we might simplify reality a bit with such a statement. The contemporary art scene in Budapest is in continuous development. 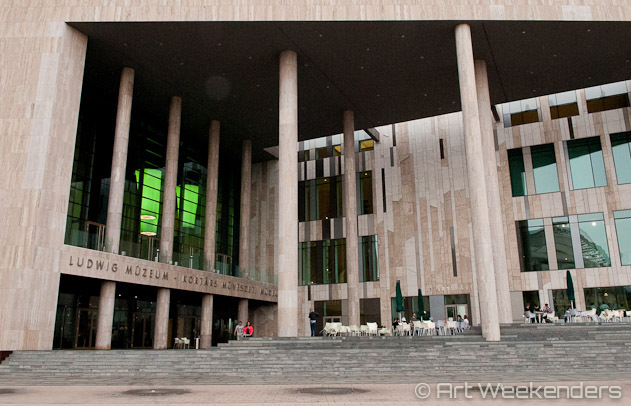 While most of its museums are having the focus on the classic arts, there is an evolving art scene, where in our opinion the Ludwig Museum of Modern Art takes the centre part. We will look further into the Budapest art scene soon. Architecture in Budapest is in many ways unique. The main highlights of the city are the two massive architectural achievements, the neo-gothic parliament House on the Pest side of the capital and the Castle Hill with the dominant castle overlooking the city. But the city-architecture is more than so: be it the bridges or the broad avenues, Budapest will satisfy your eyes with its building and structural display. Scezhenyi Bath, by ElinB, Flickr Creative Commons. As a visitor to the city you are possibly well aware of the major – and unique – allure the city has: its thermal bath scene. Situated on top of the biggest thermal spring tunnel system in Europe, the city’s bath culture developed early on. There are in fact remnants already from Roman times. The major influence came though with the Turks and most of the bath houses have their roots in that era, thus some half a millennium back in time. While the influence is Turkish, the experience is fully Hungarian: in fact, going to the bath is today part of the Hungarian lifestyle. Most bath houses are circling around some main pools, complemented with a multiplex of steam baths and massage services. As a first-time visitor, you might find the Hungarian massage services a bit special, just for your information. 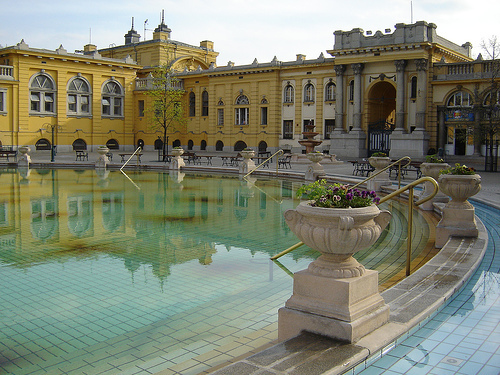 The most famous baths of them all are the Széchenyi Fürdő and the Gellért Baths. Both are more than a bath experience: the fantastic Art Nouveau architecture surrounding you creates a very special atmosphere. The two mentioned suggestions are surely the big names in town, but if you look for a more intimate experience we can strongly recommend the Veli Bej Baths, newly modernised and more popular with a young professional crowd. 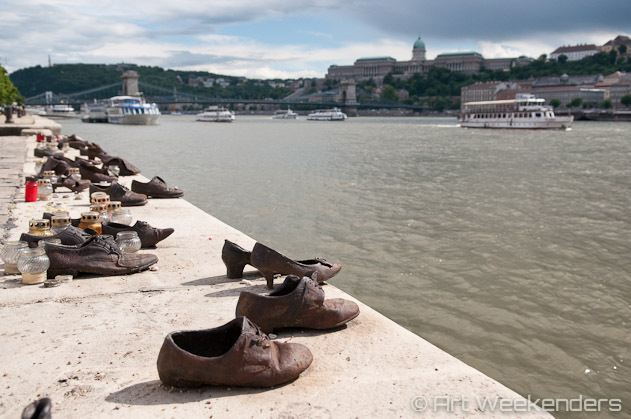 Shoes Along Danube, Budapest. WWII Monument. 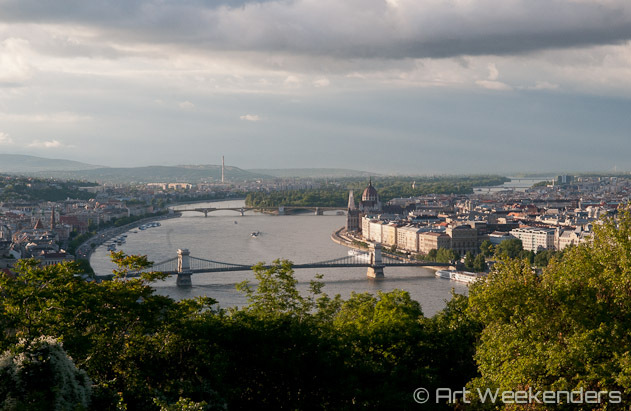 Art destination Budapest is a city like not many others. The language barrier you’ll face here attributes to the special feeling to a high extent. It’s fair to say that while with many other European languages it’s doable to relate what certain words mean, the Hungarian language on the other hand can come across as fully impenetrable for a visitor. Having its roots back in the Ural mountains at the outskirts of Siberia, the language migrated with the different people – among others the Magyars – to current-days Hungary, making this language an oddity in Europe. But don’t worry, most Hungarians will speak at least one other language. The younger generation use to speak more English, while the older age group will be predominantly familiar with German. There are many ways to fill your weekend in Budapest and our intention is to help you with choosing what to do to enjoy your time here best, not only with this site – that we’ll constantly fill with more content about the city – , but also via our itinerary guides that you can soon find for download in our shop.